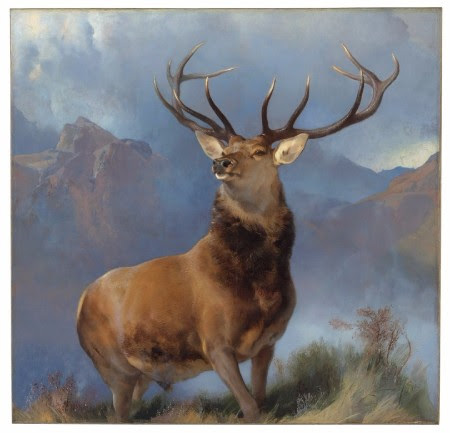 The Monarch of the Glen by Sir Edwin Landseer is one of the most famous paintings of the nineteenth century. For many people around the world this image encapsulates the grandeur and majesty of Scotland’s highlands and wildlife. It has also taken on a symbolic status in the popular imagination as a romantic emblem of Scotland and the natural wonders the country encapsulates. Will you help us secure this iconic painting for future generations? The Monarch of the Glen has been in private and corporate collections since it was painted in 1851. The ideal home for such an important and resonant picture is the Scottish National Gallery where it can be enjoyed and admired by millions of visitors in the context of the nation’s unrivalled collection of Scottish, British and European art. We now have the opportunity to secure the painting for permanent public display in Scotland. The present owner of the work, Diageo, has agreed to gift half the price of the picture. Through the generosity of the Heritage Lottery Fund, the Art Fund and generous supporters we have already raised over £3 million. We are now embarking on a fundraising campaign to secure the remaining £750,000 required by mid-March. This is a once-in-a-lifetime opportunity for this major work to pass into public hands for the first time in its history and for future generations to enjoy. Any help you can give towards safe-guarding this remarkable painting is very much appreciated. Online at https://www.nationalgalleries.org/supportus/donate-online/ or by clicking the ‘Donate Now’ button below.